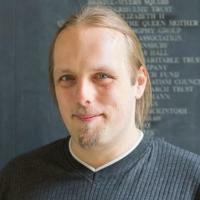 This checkin to OK045D Kinkering Congs Their Titles Take reflects an opencache.uk log entry. See more of Dan's cache logs. Added new cache container. Improved clue. This checkin to GC1G4E3 Kinkering Congs Their Titles Take reflects a geocaching.com log entry. See more of Dan's cache logs. Added more-waterproof cache container. Improved clue. Note that old cache container may still be in place: wasn’t able to find it and was being watched by muggles; I’ll return to re-hunt for and remove the old container soon. New cache container is assembled and ready to deploy as soon as I’m in the vicinity; hopefully next week! This checkin to GCHDZH Cobblers! (Dorset) reflects a geocaching.com log entry. See more of Dan's cache logs. Just visiting while dropping off my brother in law for his sponsored 500 mile “Lyme Regis to Limekilns on a Lime Bike” cycle, and thought I’d hit a couple of local caches before I set off back to Oxford. Great hiding place and a well maintained cache, thanks! This checkin to GC61PA7 In the Lyme light reflects a geocaching.com log entry. See more of Dan's cache logs. While dropping off my partner’s brother and his friend on their 500 mile “Lyme Regis to Limekilns on a Lime Bike” sponsored cycle ride, I took the opportunity for a quick grab of this nicely hidden cache. Logbook rather wet, needs replacing. TFTC! This checkin to OK045C The Fairy Elevator reflects an opencache.uk log entry. See more of Dan's cache logs. Reassembled hoist mechanism. Improved route of paracord to make ascent easier but it’s still a wrap-it-round-your-hand-and-heave job. This checkin to GC7R0HB The Fairy Elevator reflects a geocaching.com log entry. See more of Dan's cache logs. This checkin to GC54KVD Oxford Medical History #2: Grey matter reflects a geocaching.com log entry. See more of Dan's cache logs. This checkin to GC5J655 GO Active Cutteslowe and Sunnymead Park reflects a geocaching.com log entry. See more of Dan's cache logs. CO hasn’t logged in in almost 3 years. No finds in 8 months. During that time I’ve repeatedly tried to contact CO both through this site and through Go Active Oxfordshire (to report this as probably-missing and to volunteer to help with its future maintenance if they want to bring it back to life), but never received a response. I strongly suspect that this cache is abandoned by the organisation that set it up. I’m reaching out to them today, one last time, but if they don’t respond then I suggest that this be considered for archiving by an administrator. Dropped by to perform routine maintenance to discover that this cache has been partially muggled: the lifting mechanism has been cut and the pencils have been removed. However the cache itself is otherwise functional. As a stop-gap the cache is temporarily hidden BEHIND the tree (rather the hoisted up it); I’ll look into a proper fix as soon as I’m able. This checkin to GCG6XD Britain's highest Geocache reflects a geocaching.com log entry. See more of Dan's cache logs. Found today at 11:30 with Robin, whose ascent marked his final expedition this year as part of his 52reflect.com project. I’ve been up here many, many times before since this cache was placed (and some before) but only this time taken the effort to find and sign. TFTC! This checkin to OK0231 St Giles Webcam Cache, Oxford reflects an opencache.uk log entry. See more of Dan's cache logs. Wandered out of my office and around the corner to this cache, which has long been on my to-do list, this afternoon. Waved at the new camera! Note to future visitors: looks like the “lag time” is about 45 seconds, so you’re likely to have to stand around a bit. I’ve attached a picture showing the window where the camera now sits so you can position yourself appropriately. Good luck! 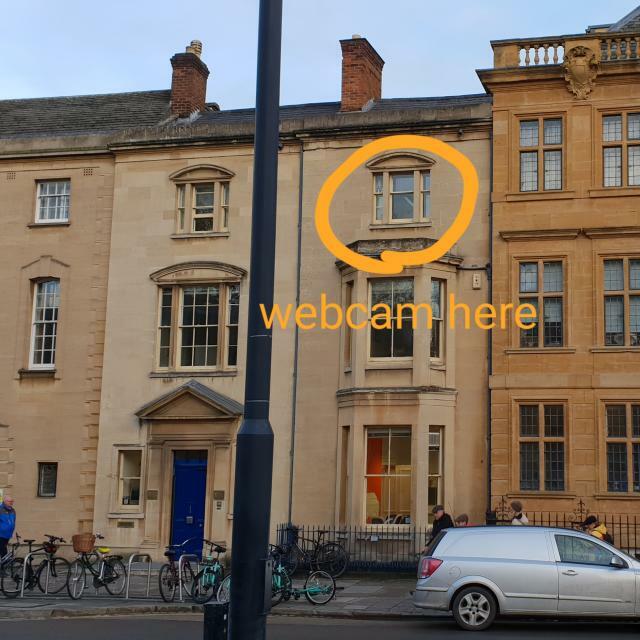 The new webcam points out of this window and has about a 45-second lag. 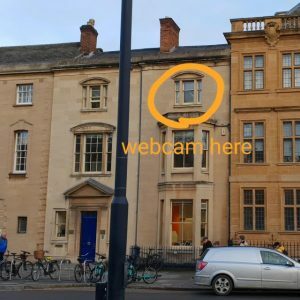 Looks like the webcam is now back up, but the URL on this page needs revising to https://www.oii.ox.ac.uk/webcams/ and/or https://www.youtube.com/watch?v=xh48dJYojmE. Going to try to get out there when I can. This checkin to GC7QG1Z Oxford’s Wild Wolf Three reflects a geocaching.com log entry. See more of Dan's cache logs. At community suggestion, replaced containers at waypoints #1 and #2 with smaller, more-discreet variants to help reduce risk of future muggling. A geocacher still shouldn’t struggle to find these containers, though: they’re pretty obvious once you’re looking in the right place!